So, can't find my favorite Tom Daniel design. Only one thing to do, make my own. This is an updated version of course. Two Mercedes 600s were spliced together, a 1/35 scale Marine landing craft gave up the tracks, a Landrover supplied the front wheels, radio equipment, and machine gun. The computer console came from the Caprice Police car. The tank commander from a 1/25 scale Tiger was put in charge. 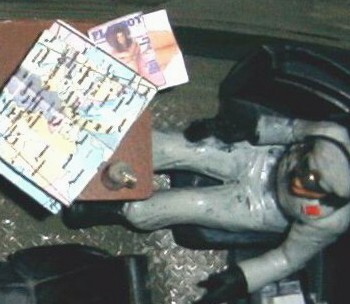 An European map was printed from Corel Draw, and Herr Commander's favorite literature was also reduced using Corel. The beer stein came from the Soda Wagon reissue. Some of the emblems are a combination of 1/35 scale military kits, Letraset transfers, and hand painted. This was built just for the fun of it, and practice for the actual Rommel's Rod replica on (or under) the workbench. I am using Mercedes SSK roadsters and a 1/35 scale German half-track that closely matches the back half of the original RR.